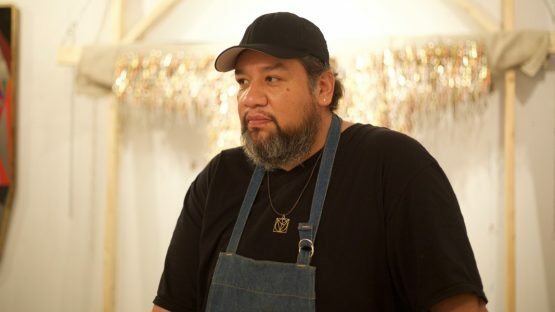 Part Choctaw and part Cherokee, Jeffrey Gibson is a New York-based artist who creates abstract sculptures, paintings and prints that provide an autobiographical cultural insight into the life of their author. Gibson’s vast influences range from 19th-century Iroquois beadwork to contemporary street art, radically different inspirations that glamorously collide within this man’s work. Jeffrey says that part of his practice was a reaction to a nostalgic and romantic vision of pre-colonized Native American life. Gibson’s practice often includes sculpted pigmented silicone, in addition to the simultaneous use of oil, acrylic and spray paint – the variety of materials allow Gibson to create layers of patterns in low relief or thick impasto. Jeffrey Gibson was born in Colorado, but he spent the majority of his childhood moving from one place to another. Being exposed to such diversity early on played a major role in establishing young Gibson’s initial artistic impulses, as explained by the artist himself: This unique combination of cultural perspectives and exposure are essential to understanding Gibson’s artworks that combine and transform seemingly disparate references drawn from both Western and non-Western sources. In 1995, Gibson earned his Bachelor of Fine Arts from the Art Institute of Chicago, followed by a Master of Fine Arts received from the Royal College of Art in 1998. It should be noted that the aforementioned Master’s Degree was paid for by the Mississippi Band of Choctaw Indians as Jeffrey was always supported by his community who praises itself on taking care of its own. The centerpiece of Gibson’s art is his nomadic lifestyle: I bring together varying aesthetics of each place I visit. Some have had specific cultural aesthetics, language barriers, cultural barriers, etcetera. These differences funnel through me, a queer Native male born toward the end of the 20th century and entering the 21st century. I consider this hybrid in the construction of my work and attempt to show that complexity. Beside his nomadic lifestyle, Jeffrey also finds inspiration in events that revolve around dancing, especially anything that’s got to do with the life work of Leigh Bowery and his dramatic nightclub persona. Events such as raves provide contrasts as rural and urban venues, serving as spaces for dancing, movement, and dramatic fashion/regalia. Gibson is fond of using both Western and non-Western techniques as the means getting to an end are not so important as the result of their usage. Jeffrey Gibson – Amazing Grace / Dearly Beloved… And Did You Ger What You Wanted From This Life? 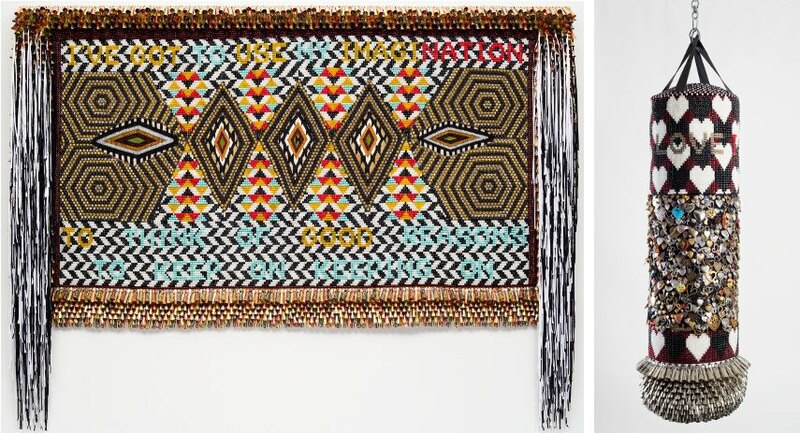 Jeffrey Gibson provides us with a unique investigation of Native American stereotypes observed through the prism of cultural critique, iconography and found objects. Highly aware of his identity and all of its aspects, this man’s art navigates the space between formal abstract language and Native American totems, offering an original set of abstract sculptures, paintings and prints that celebrate multi-cultural lifestyle. 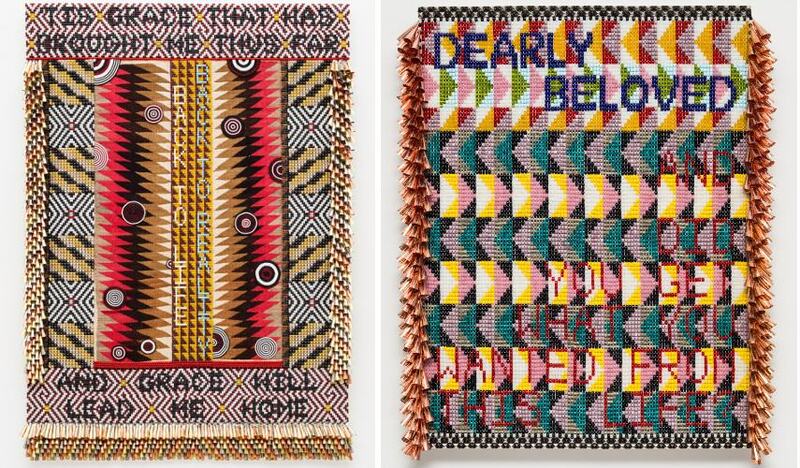 In many ways, Jeffrey Gibson opens his soul to the viewers who are observing his work as he tends to channel all the deepest emotions into his art, unfiltered and not willing to compromise on any creative or factual front. 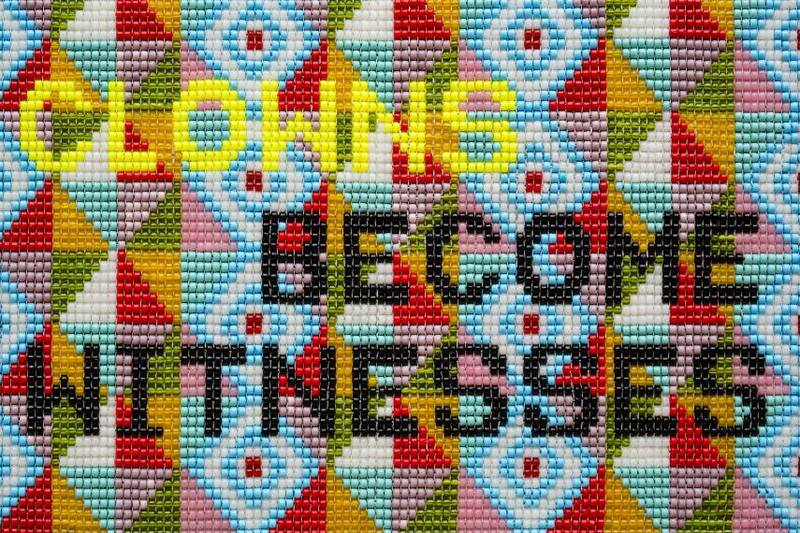 Jeffrey Gibson lives and works in New York City, the United States.